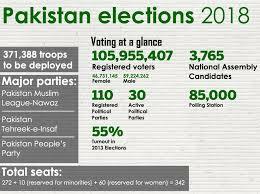 Pakistan completed its eleventh general election last month amidst serious security concerns, questions about the role of the military establishment in election and reported restrictions on certain media houses and journalists to prevent them from discussing sensitive issues. The elections were observed by 19000 volunteers from Fair and Free Election Network (FAFEN), a domestic citizen observer group, the European Union Election Observation Mission (EUEOM) and the Commonwealth Observer Group (COG). The conclusion of all three observer groups was that on polling day, voters expressed their will freely with no complaints received from any stakeholder about the military interfering in the voting process. They also concluded that in the pre-poll period, political developments helped Pakistan Tehreek Insaf (PTI) increase its vote bank at the cost of Pakistan Muslim League-Nawaz (PML(N) and to some extent, Pakistan Peoples’ Party (PPP). The post-poll process is yet to be wrapped up as preliminary results have been contested and the Election Commission of Pakistan (ECP) has ordered recount in over 70 constituencies for both the National Assembly and Provincial Assemblies’ seats. While the outcry of pre-poll rigging had not faded from the minds of the supporters of PML(N) and PPP, which secured second and third places respectively in the National Assembly in the 2018 general election, the long delay in the announcement of results immediately after the poll, contrary to the claims of the ECP to announce results starting 2:00 am took away the gloss from what was otherwise a peaceful and orderly polling day, except for one terrorist explosion near a polling station in Quetta which claimed the lives of 31 people. As the midnight of 25 July 2018 approached, questions were raised about the failure of the ECP’s Rapid Transmission System (TRS) as to whether this was simply the crash of the Android App developed by the ECP for the secure online communication of the result-count of each polling station on the prescribed Form 45, or was it the real game changer in rigging which overturned the will of the people in the early hours of 26 July 2018 to produce fixed results favouring PTI. The ECP had aimed to beat private TV channels by announcing early results instead of allowing the latter to guess the results and cause a controversy about the ECP’s counting and tabulation process. The ECP had also gone a step further to avoid criticism from losing candidates and parties that it was an ROs election, as was alleged by PTI in 2013. At this election, the ECP had recruited returning and district returning officers (ROs and DROs) from the judiciary to ensure they did not come under political pressure from the local administration or political parties to alter the results of the poll during compilation. Yet, on the day itself the ECP’s RTS App miserably failed. Its website was also woefully lacking in information about unofficial results ahead of private TV channels. In their preliminary report released on 27 July, the European Observers pointed out that the advances made in the legal framework of elections and the measures introduced for increased women’s participation in the election had been overshadowed by the timing of criminal convictions of key politicians on account of corruption; contempt of court cases against certain candidates; and terrorism charges against the workers of one political party. The EUEOM claimed that the level-playing field for campaign lacked in equality of opportunity. In its interim statement, the Commonwealth Observers noted that Pakistan’s 2018 general election was conducted under a substantially reformed and improved legal framework but some stakeholders questioned the impartiality of the military and judiciary and cited the timing of court cases against certain political leaders and candidates as an example on uneven playing field. The COG also noted that the media and civil society representatives they met had mentioned that editors and reporters received threats and were prevented from covering certain issues, such as the rights of minorities, performance of judiciary and the role of state institutions. Some journalists and bloggers were reported to have been kidnapped, harassed or intimidated for their critical coverage. These incidents reportedly resulted in increased self-censorship. The 2018 general election should be seen in the context of Pakistan’s long transition to democracy. This was the second time the general election was held under a civilian administration. It was also an election which had the war on terror still waging in the background in which Pakistan lost 76,000 people, of whom 68 percent were civilians and 32 percent from the armed forces. In the weeks prior to election, three terrorist attacks in Khyber Pakhtoonkhwa and Balochistan provinces claimed the lives of 170 people including 2 provincial assembly candidates. There is not a single election in Pakistan where the level-playing field was not disputed. The 2008 general election was organised under a caretaker government but General Musharraf held both the office of President and Chief of Army Staff. In that election, even if the PPP had not benefited from the sympathy vote on the eve of Benazir Bhutto’s assassination, the only party which suited General Musharraf’s vision of enlightened moderation was PPP. The 2013 general election was held under a civilian administration but PTI called it an ROs election alleging that it was fixed by the army and the judiciary in favour of PML(N). The same accusations are now being traded by PML(N), PPP, MMA and MQM, all losing parties against PTI in the 2018 election results. A walk through Pakistan’s political landscape two years prior to the 2018 general election shows how PML(N) dominated the political field in the country. In the 342-seat National Assembly, PML(N) held 188 seats, followed by PPP (46 seats), PTI (23 seats), JUI (13 seats) and Independents (9 seats). The remaining parties represented in the 2013-2018 Parliament held five or less seats. It was not just the Parliamentary majority PML(N) enjoyed in the centre. PML(N) also formed governments in Pakistan’s largest province Punjab and in Balochistan, the latter with the help of local parties. The state institutions, such as the National Accountability Bureau (NAB), Federal Investigation Agency (FIA), the Intelligence Bureau (IB), other regulatory authorities such as PEMRA, the Parliament and the Judiciary were under the control of the ruling party and unable to address the charges of corruption raised by the opposition against PML(N) leader Nawaz Sharif and his family. Had this situation continued, there would have been no level playing field for the 2018 general election, as PML(N) would be all powerful to use the same state institutions against its opponents. But this may be a hypothetical question because what was supposed to be a realignment of institutional independence in relation to the ruling PML(N) eventually ended up clipping its wings so close to skin that it became the underdog in the weeks preceding the election, with its leader imprisoned for graft and some of its top leaders disqualified from contesting the election on account of aiding and abetting corruption or contempt of court. The fall of PML(N) from grace was not natural but induced and “all the king’s horses and all the king’s men couldn’t put ‘Humpty’ together again”. As early as 2016, when Nawaz Sharif realised that the sceptre of Panama Papers was not going to go away, he made a clever move to play the ‘Establishment’ card, which was politically designed to restore his public image and undermine the military which he never trusted after the 1999 military coup. His two interviews to a local journalist in the daily Dawn in October 2016, and again in May 2018, were designed to nail the military as the ‘bad guys’. Although in the long run this proved unhelpful, he was able to get on board the liberal civil society and the outward looking media on his side. They bought his story that there were parallel governments in Pakistan and that not only there was a government within government but a government on top of another government. This resulted in the making of strange bedfellows. The centre-right PML(N) and centre-left liberal media such as Dawn and Geo, and civil society organisations such as the Human Rights Commission of Pakistan (HRCP) expressed concern over military interference in civilian democracy and stressed the supremacy of civilian institutions over the military establishment. Ironically, the same liberal media and civil society, on the other hand, shared the army’s zero tolerance for corruption and graft associated with Nawaz Sharif and his family, as well as other politicians in PPP and PTI. The army was sanguine in the view that the war on terror in which it had played a major role could not be won while politicians indulged in corruption under the veil of democracy and got away with it. Still more interesting was the role of the official opposition PPP which shared the view of the liberal media and centre-right PML(N) about civil-military relations but decided against upsetting the apple cart of democracy by forcing the PML(N) government to resign half way without completing its term of office. This explains to a large extent the two rulings by the Supreme Court in July 2017 and February 2018 which disqualified Nawaz Sharif from holding the office of Prime Minister and preventing him from keeping an official position in his party. In the first ruling, Nawaz Sharif was convicted of violating Article 62(1)(f) of the Constitution which requires a member of National Assembly to be “honest and trustworthy”. In the second ruling he was convicted of corruption resulting in his imprisonment for ten years and a fine of GBP 8 million. Although Article 62(1)(f) of the Constitution is open to subjective interpretation and has been applied inconsistently by the courts, it was the only smart, although strictly not technically legal, way to create a level-playing field by freeing other institutions of the state such as the NAB, FIA, PEMRA and the Judiciary from the clutches of the PML(N)-led Executive and Parliament to play their independent role in exposing the corruption of politicians across all parties. The July 2017 ruling of the Supreme Court against Nawaz Sharif was hotly debated by lawyers on both sides of the political divide supporting or opposing him. His protest phrase ‘mujhey kiyun nikala’ (why did you oust me) went viral on the internet and was used both by his supporters and the opposition to express their views. In the same ruling, the Court directed the NAB to file references against Nawaz Sharif and his family in an accountability court using the findings of the Joint Investigation Team (JIT) which it had established to probe the charges of corruption. The accountability court completed its proceedings without any pressure from the once powerful PM House. It is, however, another issue that the July 2018 judgement of the Accountability Court, convicting Nawaz Sharif for corruption, had many holes and stands a good chance of quashing if the defence is able to prove that the judge failed to find evidence of Nawaz Sharif’s corruption in the unnamed ownership of Avenfield Apartments in London and instead, relied on circumstantial inference. The conviction has been appealed by Nawaz Sharif’s lawyers in the Islamabad High Court. The military establishment got what it wanted in the conviction of Nawaz Sharif but it went for the overkill by gagging media to write editorials on civil-military relations or cover the narrative of PML(N). Conversely, no restrictions were imposed on media supporting PTI or denouncing PML(N). The military establishment’s alleged encouragement of new and small parties such as TLP in Punjab and PSP in Sindh emboldened these parties to nominate candidates in the election beyond their electability, which eroded the right wing vote of PML(N) and the liberal but parochial vote of MQM, both of which were not kosher in the military establishment’s books. But the military establishment neither intended to, nor was it capable of stuffing ballot papers and overturning the results by hijacking the counting and tabulation process in the night of 25-26 July 2018 to get the result it wanted. For example, the strong watch of civil society organisations and local and international observers on the military personnel who were assigned security duties inside and outside polling stations acted as a deterrent and there were no complaints of their meddling in the voting process on election day. Similarly, the extraordinary delay in election results which created doubts about the transparency of election and systematic rigging of results did not materially affect the outcome of the poll because the tabulation of Constituency result on Form 49 was based on the results of Form 45 which contained the initial count conducted by presiding officers at the 85,000 polling stations in the presence of security personnel across the country, and was shared, although not in full compliance of the ECP rules, with party agents present at the count. Any reviews admitted by the election tribunals will take into account the data entered by presiding officers on Form 45 and the record of ballot papers on Form 46. The military establishment could not have changed thousands of Forms 45 and 46 in one night even if it planned to affect the outcome of the votes. This is substantiated by the fact that contrary to media reports that the establishment had forced a large number of PML(N) candidates to change loyalties and contest elections as independents, only 13 independents out of 1623 who contested the election, won seats in the National Assembly. Of the 120 independent candidates believed to have been backed by the military establishment for using the Jeep symbol, none, including the blue eyed boy of the military (Chaudhry Nisar), secured a place in the National Assembly. The PSP was also totally wiped out in Urban Sindh and TLP barely managed to get one seat in the National Assembly. The pro-military MMA got only 12 seats. Interestingly, PTI which was allegedly the favourite of the army failed to win outright majority in the National Assembly, and PML(N) which held the army responsible for its misfortunes still got a robust tally of 64 seats in the National Assembly followed by 43 by the PPP. The PML(N) received the most number of seats in Punjab Assembly and PPP received the most number of seats in Sindh Assembly. There was no way the military establishment could have prevented these parties from securing these results. Although the new and improved legal framework for the 2018 general election was strong, and the ECP had full autonomy and powers to conduct the 2018 general election, there were many areas where its shortcomings were notable. One was its inability to effectively use IT to collect and assimilate voting results electronically and to make its website live and user-friendly for the general public; to extend the voting rights to overseas Pakistanis; to adequately security vet candidates against their proscribed status and links with groups placed on anti-terrorist lists; and to take timely action on the violations of various codes of conduct by media, political parties, presiding officers and polling agents. The ECP was also criticised for lack of clarity in assigning the powers of the presiding officers and the military officers who commanded the security personnel inside and outside polling stations; for insufficient voter education; for not imparting full and proper training to election management staff; and for imposing no financial limits on political parties to hire print space and airtime for their campaign advertisements. On the positive side, the ECP deserves congratulations for completing the voter registration and delimitation exercise based on the new Census 2018 despite numerous challenges; for enabling 53 percent electorate to come out and vote peacefully on the polling day; for giving magistrate powers to DROs, ROs, and POs to take legal action on the spot, where required; for encouraging women participation by requiring political parties to allocate at least 5 percent share in their nominations; for discouraging political parties to conclude agreements for women-free voting by requiring each constituency result to have at least 10 percent women votes balloted; and for facilitating transgender persons and people living with disabilities to cast vote without hurdles. Democracy is not just about holding free and fair elections. Elections are the first step toward a representative government and a robust opposition safeguarding the constitutional rights of all its citizens irrespective of their vote preference; and enacting policies which benefit all, especially minorities and marginal communities. But this first step should be right, and follow right channels. It is a good sign that all opposition parties, including PML(N) and PPP have agreed to attend Parliament and seek redress through the conflict resolution mechanism provided by election tribunals. Until the wider political issues such as civil-military relations, separation of powers between the three branches of government, an active opposition in Parliament and the enhanced role of oversight parliamentary committees as well as other institutions of the state to end corruption and misuse of privileges in public office are addressed separately and comprehensively, it cannot be said with certainty that Pakistan is out of the woods as far as the future of democracy is concerned. However, these issues relate more to political governance than election management and will take time as democracy flourishes in Pakistan, one step at a time.